These spiders are are very shy and usually stay hidden until they sense a vibration in the web made by a prey item trapped in the sticky silk. They then quickly move out to retrieve the juicy morsel. Spiders belong to the Arachnid class. They have 8 legs and two body parts; cephalothorax and abdomen. They have fang-like mouthparts (no mandibles) to pierce and break up prey; these are connected to a venom gland. They have a 5th pair of appendages behind the mouthparts called pedipalps. The male pedipalp has a structure used to transfer sperm to the female. There are three species of funnel-web spider commonly found in Southern Arizona. They look like a small wolf spider; about ½ inch long. 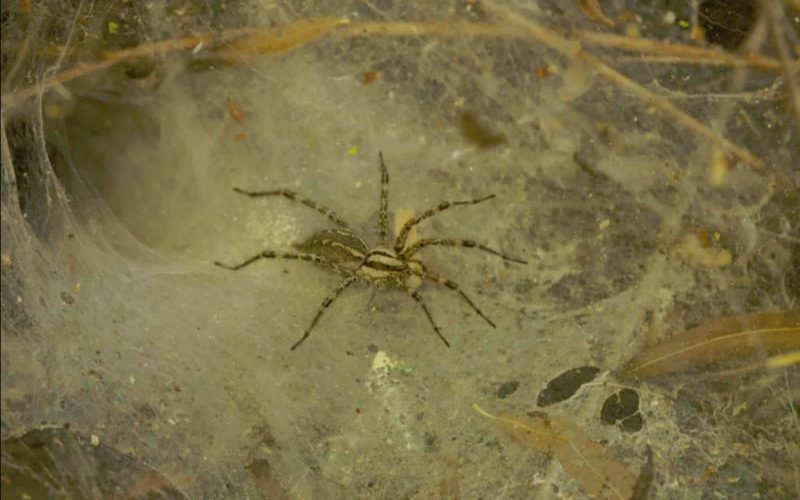 Whereas the home of the more robust wolf spider is a hole in the ground surrounded by a turret of twigs, the funnel-web spider builds a web with a distinct funnel shape that leads to its lair. A common name for this creature is “grass spider” because the webs are often found in grasses. These spiders are harmless to humans. They are very shy and usually stay hidden until they sense a vibration in the web made by a prey item trapped in the sticky silk. They then quickly move out to retrieve the juicy morsel, taking it back to its lair. The author watched the one in the photo begin to come out and retreat several times over about a half hour until he was finally able to get a couple of photos. March through October are the active months for funnel-web spiders. Prior to mating, a male will approach the web and make sounds by rubbing its legs together and will stroke the web. If the female desires, she will allow him to come onto the web where mating occurs. She lays 100 – 200 eggs in a case that she weaves into the web near or within her funnel retreat. The eggs hatch after one month and the young move out; what a great idea! This photograph was taken in September 2010 in the riparian area above Sabino dam.